I know these have been EVERYWHERE recently, the majority of you probably own a pair or something very similar. However I'm still in the honeymoon phase from my purchase of these babies - still so crazily in love with them! And I know, I know, this is what everyone says, but hey, whatever, I don't care, I'm in love. I've been after some properly high waisted jeans for aaaages, I've looked at the American Apparel 'Easy-Jean' many times, however American Apparel prices are wayyy past of my bank account balance! 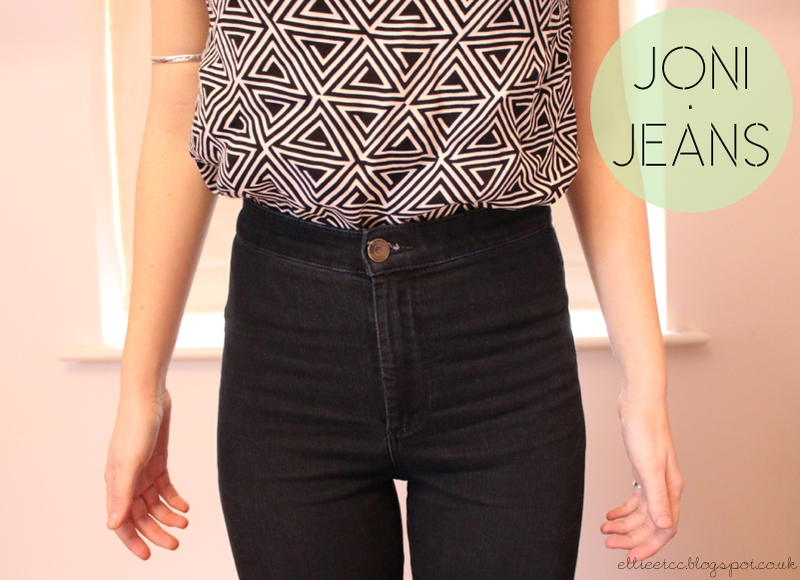 So upon finding these super high waisted pair in Topshop during one of my daily browses - I knew I had to get me some Jonis! As you may or may not know, I am the type who cannot resist a bargain, so I immediately checked out eBay. Long story short, I probably should have just brought the full price ones, as I didn't get quite as good a bargain as I'd hoped. BUT, I got the infamous Joni Jeans! This is a pretty simple outfit as I wanted the main focus to be on the jeans! I've whacked on my faux-leather jacket and black boots with this. You may recognise the top from my Charity Shop Haul post, its such a cool print and looks so great with these jeans - as does just about everything else! I could honestly just write pages of lists of reasons why I love them!